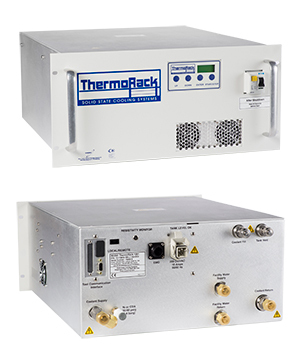 Designed specifically for the toughest Semiconductor Etch applications, the ThermoRack 1201 provides precise temperature control with ~80% less power than conventional refrigeration-based chillers. With only two moving parts and no compressor, this thermoelectric-based chiller is known for high reliability and long life. The ThermoRack 1201 reduces environmental impacts by consuming less power, using 60% less facility water, reducing air conditioning load by 85% and not requiring any Freon or other chemical refrigerants. The ThermoRack 1201 is offered in multiple configurations based upon the specific process tool and communications interface. Currently, we offer these for most Lam Research, Tokyo Electron and Applied Materials Etch platforms as listed below. Trillium is the exclusive distributor and authorized service organization for the Solid State Cooling ThermoRack 1201 for USA and Israel based semiconductor end users.